Merri carefully crushed the ingredient in her mortar then measured up the amount and dropped a small handful in her cauldron. The liquid within turned a nasty shade of green then a murky brown. It's suppose to be pink!. The professor stood up, looked over her work, frowned, then returned to sitting. Upset that she would have to try again she let her head fall against the table she was sitting at with a soft 'thud' and followed the action with a loud sigh. Double potions had been awful, but to follow her bad luck she had to stay after class and practice brewing a potion. A potion that she had messed up on in class not once, not even twice, but three times. "I hate potions," she mumbled to the wooden desk her face was pressed against. Rinoa happened to pass by at the third floor near the Potions Classroom. She heard something that came from the room. "At this hour?" she asked herself. "Classes should have been finished by now" she continued and peeked at the room. Upon doing so, she spotted Merri with her head on the desk. She ran inside and grabbed Merri's shoulder and pulled her up. She shook Merri's body and asked "Are you okay? Are you okay?" Merri groaned and opened her eyes. "Must you jostle me so, Rinoa." She blinked her vision still a little blurry from her face being pressed on the desk. "Rinoa!" Suddenly standing up she began to jump up and down then hugged the other girl excitedly, "You've come to save me. Haven't you?" She heard the professor shouting in the background and jerked back towards the front of the classroom to apologize and sit back down. "Sorry. I can't go anywhere till I learn to brew this dumb cure for boils potion." She sighed and waved her wand over the ugly brown liquid making it disappear. Why can't I disappear too? "I don't plan on getting boils, so why do I have to learn this." Rinoa let go of Merri as she heard that the Professor was still in the room. She shrugged and whispered "I'm sorry. I thought you were hurt or something when I saw your head on the desk, I panicked". "So, what went wrong?" she asked Merri when she saw the brown liquid before Merri waved her wand. Merri frowned at the items set out before her and slowly shook her head. "The professor said I put in the wrong ingredients the first time. The second time I didn't stir it correctly. The third time I crushed my ingredients up too much or something. I'm hopeless" She sighed and gave the professor a pleading look. "Please?" She looked up at Rin hopefully and smiled her best smile. Rinoa giggled as she heard Merri has already tried three attempts but all failed in different ways. She heard the Professor and looked at Merri's plea. "O-okay" she answered her cheerfully. "So let's start from the top" she said as she took out and prepare the ingredients and materials needed. Rinoa handed the mortar and pestle to Merri "Here. Start off with 6 snake fangs". Merri gave a huge sigh of relief and watched closely as Rinoa took out the necessary ingredients. She quietly named the ingredients in her head and tried to remember why those were the ingredients selected. "Place snake fangs in mortar and crush into a fine powder" She took the pestle and began to vigorously pound the snake fangs into oblivion. Die die die die. Merri chanted cheerfully in her head as she smashed each fang. Rinoa's eyes widened when she saw how Merri crushed the poor ingredient. She immediately held Merri's hands and said "You're going to crush the poor mortar and pestle too if you'll continue with such strength" then smiled weakly at her. While holding Merri's hands, she gently guided them to crush the snake fangs using just enough force. Not too much, not to less. Then she let Merri crushed the rest. Merri turned red from embarrassment, "Maybe that's why the potion keeps turning a mean brown color." She finished crushing up the fangs then pointed to the cauldron. "I have to put them in there now right?" She scooped up a small handful and dumped the powder into the cauldron, watching curiously as the water changed into a bright red. "Yes yes that's it, carefully now" Rinoa said to Merri as she placed a handful of the crushed snake fangs in the cauldron. "Next is to wait for 10 seconds" Rinoa stated. After 10 seconds Rinoa waved her wand. After which she handed the next ingredient to Merri's hands, "Four horned slugs" she said. Merri turned her nose up at the jar of horned slugs. "Those are disgusting!" She declared then reached in and pulled one out. "And they smell bad!" She hurriedly dropped the four slugs one by one then looked back down at her notes. "The porcupine quills now?" She bounced up and down excitedly as her potion was slowly starting to turn a lighter shade of red. "Yes, but before that, we must take the cauldron off the fire" as waved her wand to put out the fire. The liquid's slowly turning to a much lighter shade of red as the fire went out. "Now, 2 porcupine quills" she instructed to Merri. Merri nodded as if she had known that all along, when in fact every single time she had failed to remove the cauldron from the fire. Leaning over her potion she carefully dropped the two quills then read from her notes again. "Stir clockwise 5 times then wave wand"
Previously she had also made a mess of stirring but this time, not wanting to make any mistakes she gently stirred the mixture then pulled out her wand and waved it over the liquid. "Is it right?" "That's just fine, Merri" she said looking carefully at how Merri worked. Then suddenly, Rinoa smiled as she saw the light shade of red slowly turning pinkish. Merri began to jump up and down excitedly, almost knocking the potion over in the process. "We did it! Look Mr. Professor, we did it!" She looked over to where the professor had been grading essays and noticed he had already left. "That's not nice." She shrugged and went back to celebrating by dancing around the potions class room. "See you can do anything if you keep on trying" Rinoa said smiling at Merri. She also felt happy for Merri's success. "It think you can go now" she chuckled as the Professor was no longer in the room by the time Merri had finished brewing her potion. Merri nodded then hurriedly grabbed a couple of vials and waved her wand till each vial filled up with the pink solution. "Thanks for all the help Rin!" She grinned cheerfully then hugged Rinoa tight. "Now I can go off and look for Hippogriffs or mermaids and unicorns!" Rinoa was delighted to help Merri anytime. She has been always like this to any student. 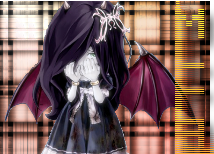 "Awww.. You'r welcome" she said as she hugged Merri back. "What!? Magical creatures? Can I keep you company?" she asked Merri. Merri gasped then nodded repeatedly, "Yes we can go find all of the magical creatures! But I don't really know much of where to look." She shoved all of her notes and supplies into her bag. "I need to go put this away and get my magical creature finding stuff! Then we can go search!" "Okay then. I'll wait for you outside" Rinoa suggested. "I also have no idea where they might be. But I think Gino can help us since he grew up in a forest and was pretty familiar with creatures" raising her index finger as she suggested the idea to Merri. Merri gave a firm nod remembering that Gino had told her about spotting a unicorn already. "Meet you outside!." And with that she raced out of the class and back towards her dormitory.